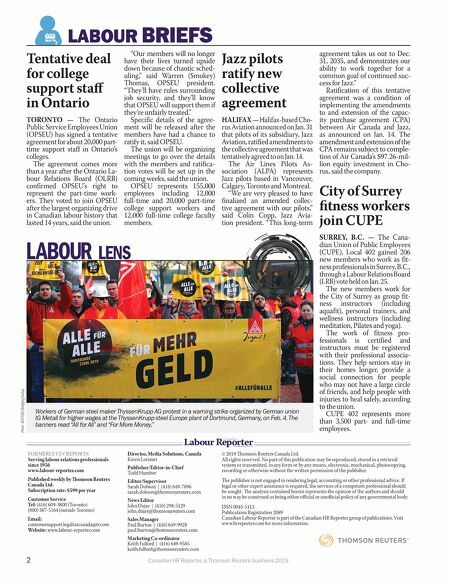 2 Canadian HR Reporter, a Thomson Reuters business 2019 Tentative deal for college support staff in Ontario TORONTO — The Ontario Public Service Employees Union (OPSEU) has signed a tentative agreement for about 20,000 part- time support staff in Ontario's colleges. The agreement comes more than a year after the Ontario La- bour Relations Board (OLRB) confirmed OPSEU's right to represent the part-time work- ers. They voted to join OPSEU after the largest organizing drive in Canadian labour history that lasted 14 years, said the union. "Our members will no longer have their lives turned upside down because of chaotic sched- uling," said Warren (Smokey) Thomas, OPSEU president. "They'll have rules surrounding job security, and they'll know that OPSEU will support them if they're unfairly treated." Specific details of the agree- ment will be released after the members have had a chance to ratify it, said OPSEU. The union will be organizing meetings to go over the details with the members and ratifica- tion votes will be set up in the coming weeks, said the union. OPSEU represents 155,000 employees including 12,000 full-time and 20,000 part-time college support workers and 12,000 full-time college faculty members. Jazz pilots ratify new collective agreement HALIFAX — Halifax-based Cho- rus Aviation announced on Jan. 31 that pilots of its subsidiary, Jazz Aviation, ratified amendments to the collective agreement that was tentatively agreed to on Jan. 14. The Air Lines Pilots As- sociation (ALPA) represents Jazz pilots based in Vancouver, Calgary, Toronto and Montreal. "We are very pleased to have finalized an amended collec- tive agreement with our pilots," said Colin Copp, Jazz Avia- tion president. "This long-term agreement takes us out to Dec. 31, 2035, and demonstrates our ability to work together for a common goal of continued suc- cess for Jazz." Ratification of this tentative agreement was a condition of implementing the amendments to and extension of the capac- ity purchase agreement (CPA) between Air Canada and Jazz, as announced on Jan. 14. The amendment and extension of the CPA remains subject to comple- tion of Air Canada's $97.26-mil- lion equity investment in Cho- rus, said the company. City of Surrey fi tness workers join CUPE SURREY, B.C. 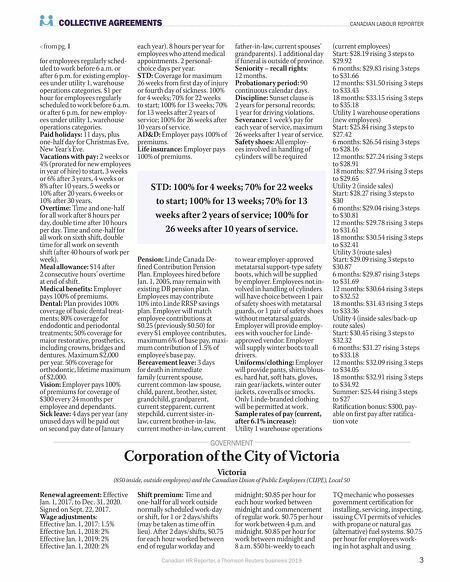 — The Cana- dian Union of Public Employees (CUPE), Local 402 gained 206 new members who work as fit- ness professionals in Surrey, B.C., through a Labour Relations Board (LRB) vote held on Jan. 25. The new members work for the City of Surrey as group fit- ness instructors (including aquafit), personal trainers, and wellness instructors (including meditation, Pilates and yoga). The work of fitness pro- fessionals is certified and instructors must be registered with their professional associa- tions. They help seniors stay in their homes longer, provide a social connection for people who may not have a large circle of friends, and help people with injuries to heal safely, according to the union. CUPE 402 represents more than 3,500 part- and full-time employees. LABOUR BRIEFS FORMERLY CLV REPORTS Serving labour relations professionals since 1956 www.labour-reporter.com Published weekly by omson Reuters Canada Ltd. Subscription rate: $599 per year Customer Service Tel: (416) 609-3800 (Toronto) (800) 387-5164 (outside Toronto) Email: customersupport.legaltaxcanada@tr.com Website: www.labour-reporter.com Director, Media Solutions, Canada Karen Lorimer Publisher/Editor-in-Chief Todd Humber Editor/Supervisor Sarah Dobson | (416) 649-7896 sarah.dobson@thomsonreuters.com News Editor John Dujay | (416) 298-5129 john.dujay@thomsonreuters.com Sales Manager Paul Burton | (416) 649-9928 paul.burton@thomsonreuters.com Marketing Co-ordinator Keith Fulford | (416) 649-9585 keith.fulford@thomsonreuters.com Labour Reporter Canadian www.labour-reporter.com LABOUR LENS Photo: REUTERS/Wolfgang Rattay Workers of German steel maker ThyssenKrupp AG protest in a warning strike organized by German union IG Metall for higher wages at the ThyssenKrupp steel Europe plant of Dortmund, Germany, on Feb. 4. The banners read "All for All" and "For More Money." © 2019 omson Reuters Canada Ltd. All rights reserved. No part of this publication may be reproduced, stored in a retrieval system or transmitted, in any form or by any means, electronic, mechanical, photocopying, recording or otherwise without the written permission of the publisher. e publisher is not engaged in rendering legal, accounting or other professional advice. If legal or other expert assistance is required, the services of a competent professional should be sought. e analysis contained herein represents the opinion of the authors and should in no way be construed as being either offi cial or unoffi cial policy of any governmental body. ISSN 0045-5113 Publications Registration 2089 Canadian Labour Reporter is part of the Canadian HR Reporter group of publications. Visit www.hrreporter.com for more information.